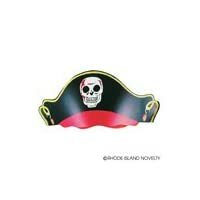 Cardboard pirate hat with colorful design on both sides. Fits up to 26 inch head; can be made smaller by using stapler for a tighter fit. Great pirate party fun!